Seth stops close and sprays a vicious line of acid across two skirmishers, horribly burning them both, then finishes the closest with his blade. 1: 4 + 5 = 9. Miss? 2: 10 + 5 = 15. Hit? CRIKEY! Whats with the lazy GM? Sorry for the delay guys, we'll get things back on track here this week. Anchor misses his first target then slays the second! MAS wrote: CRIKEY! Whats with the lazy GM? Sorry for the delay guys, we'll get things back on track here this week. Derlyn wonders to himself if some foul necromancer put a sleep jinx on the dungeon master? Derlyn crouches behind a tree stump, which may offer him some cover from certain attacks. His blast goes wild and misses its target. Rip pops out from under the table at square S-22, tankard of ale in hand. "Beer is proof that Habukkuk loves me and wants me to be happy. Not too sure how feels about you though." With a touch to his necklace he blows some foam off the top of his flagon. As it leaves the rim it becomes a cloud of putrid yellow gas heading straight for the face of Izzy at Q-22. Rip's acid cloud seems unable to gather enough power to affect the skirmisher. Two skirmishers attack Anchor but are unable to overcome his defenses. In the camp's SW corner, a skirmisher breaks free of the entangling vines and moves forward along with another who is picking his way through the tangle. They form into a pack with two others to gain advantage and attack Seth! Three Izzy's land javelin strikes on Seth, who takes 12 dmg. Gaston notices the pack of mudbellies advancing on his cadre, weighing the potential for danger behind him against the success that Anchor Chain is having. "AC, after you finish those cretins off, leave the dozey ones be. They'll be dreaming of spoiled meat and ugly mates for a while yet" he shouts. He casts a well-practiced Vicious Mockery, cursing the foul scaleskin at S-12 before he turns and climbs over the tables, ending his movement at W-21 (or wherever he can get to on the east side of Rip if the tables are considered 'difficult terrain'. "Found something to wet our whistle, have we?" He asks his stout friend..
DM, please adjust Rip's position on the map to T-22 as declared. Thanks! MAS wrote: In the camp's SW corner, a skirmisher breaks free of the entangling vines and moves forward along with another who is picking his way through the tangle. They form into a pack with two others to gain advantage and attack Seth! The black dragonborn smiles at the sight of his own blood running freely. Revealing rows of jagged sharp teeth, dripping with acid. "Now you are my worthy opponentsss. I will eat your heartsss!" The Izzys also attacked Ulric during their turn but failed to land any blows. Gaston leaps onto the table runs down its length, ending on top of it near where he intended. His insults seem to sting their target. Saves - Str. and dex. Ulric finishes the two skirmishers with a savage sweeping attack, then repositions. Seth steps forward to fight the next lzzy. He brings his longsword down on the wounded one (previosly sprayed with acid). Spends a Superiority die for Precision Attack. Damage roll: Result of the throw of dice "1d8" : 2 + 6 = 8 Slashing. If the lz is dead, Seth takes a step north to confront the next one (he also doesn't want to get flanked). Seth skewers the acid-burned skirmisher nearest him and shifts north to a safer spot. Reckless Attack, advantage strength Attacks, enemies get advantage against him. Anchor chain sees that he is needed urgently and Attacks recklessly, swinging wild at the adjacent Izzy at o-12. 4 + 2 + 5 = 11 damage. If it falls he will move to r-13use his frenzy Attack against the next nearest Izzy at s-12. If not, he will finish this one. Please note that my stat block HP field is requesting an adjustment for my forgetting that I have the damage resistance class feature. Anchor dispatches 2 more skirmishers in short order. HP retcon is good to go. MAS wrote: Anchor dispatches 2 more skirmishers in short order. "The ladies say I'm big for a dwarf..."
He cracks his Shillelagh like a whip at the Izzy trying to break up their proximity party, "By nature's hand, by craft, by art, what once was one - now fly apart!" Rip surveys the success of his squad-mates around the table and decides his talents might be best employed elsewhere. He sets down the ale tankard, takes a deep breath and stretches with a low growl. His arms and legs extend more than appears possible as his torso thickens beyond what the capacity of one breath should allow. Fur sprouts through his armor as a tail extends from under his tunic. Where a smiling fey once rested now lies a snarling sandy brown wolf, pelt flecked with white. Keen Hearing and Smell..The wolf has advantage on Wisdom (Perception) checks that rely on hearing or smell. 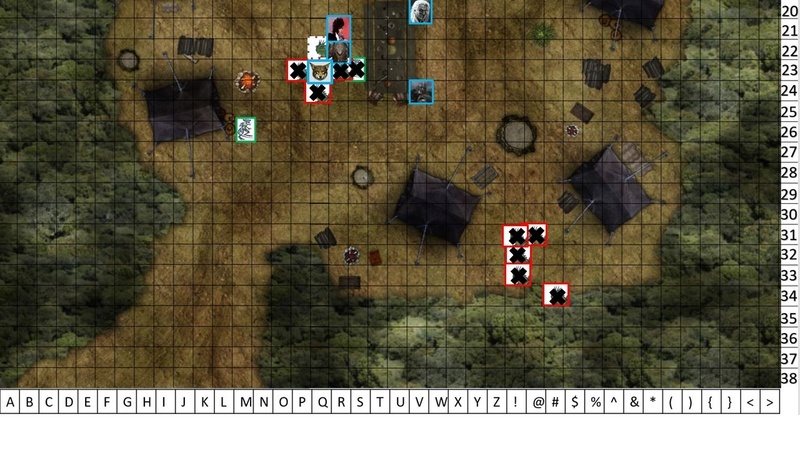 Pack Tactics.The wolf has advantage on attack rolls against a creature if at least one of the wolf's allies is within 5 feet of the creature and the ally isn't incapacitated. Bite:Melee Weapon Attack: +4 to hit, reach 5 ft., one target. Hit: 7 (2d4 + 2) piercing damage. If the target is a creature, it must succeed on a DC 11 Strength saving throw or be knocked prone. The wolf darts out from under the table and pads over to W-26 next to Ulrhic. Rip transforms and moves towards Ulric. The two remaining skirmishers who are able to attack launch javelins at Seth with fanatic malice. Having repositioned to enjoy a pack advantage standing shoulder to shoulder, they both score hits. MAS wrote: The two remaining skirmishers who are able to attack launch javelins at Seth with fanatic malice. Having repositioned to enjoy a pack advantage standing shoulder to shoulder, they both score hits. Seth cusses in draconic and spits acid. He does his best Boromir impersonation. Gaston saunters to the SE corner of the table, careful to avoid spilling any of the libations that had been provided before the ambush. He grabs his hand crossbow, casually fires a bolt off at P-23, and says to the guys "Looks like Anchor really... held it down." He then takes out a pair of sunglasses and puts them on. Gaston puts a quarrel into a wounded skirmisher, killing it and leaving a single (non-sleeping) Izzy alive. It drops its weapons, surrenders, and cowers on the ground. "Mercy, mighty ones! I will serve you if you spare me!" it begs. Combat is ended - but we will continue to take declarations in combat speed format; you have the same amount of time and actions as you would have for a single combat round right now. All players may declare their single round's worth of action at this time. MAS wrote: Gaston puts a quarrel into a wounded skirmisher, killing it and leaving a single (non-sleeping) Izzy alive. Seth has 50' of hempen rope. He takes it out and moves in on the surrendering lzzy and binds it's hands behind it's back. "A wissse decisssion lizardssscum. Now lead usss to the kobold'sss younglingsss. I may yet let you live"
Aid in tying guys up..."who's the resident interrogator around here?" Ulric asks with very little emotion and a slight smile as he looks at the party. whit10 wrote: Aid in tying guys up..."who's the resident interrogator around here?" Ulric asks with very little emotion and a slight smile as he looks at the party. Derlyn nods at Gaston. They have played "good guard, bad guard" many times in the past together. to fly open or slam shut. dismiss such an effect as an action. "I will sacrifice this one to the dark lord of the underverse! When the dark lord eats his soul, he will know all his secrets." Ulric will try and suppress his laughter as he leads Fritz over closer to the group (whenever this is possible anyway). Gaston steps forward, arms outstretched as if to protect the captive from his imminent fate. "There's no need for any more bloodshed here, Derlyn. I'm sure this helpless, simple lizardfolk wouldn't want to spend eternity trapped in the servitude of demonic darkness, forever flayed by the tips of a million whips." He turns to the bound lizardman. "Would you? There must be some way to spare you this...torturous fate. Perhaps if you told us what you are doing here and where the kobold spawn are we could avoid any further unpleasantness." Gaston flashes a smile to the captive in order to persuade him to talk. "What do you say?" *not sure how you usually run these scenarios. Do we roll what skill we intend on using here? i.e. you might rule this to be deception or persuasion. "Where are the BABIES!" Anchor chain falls on his face in the mud, exhausted. Rip, still in wolf form, tears a leg from the body of a fallen lizard man. He pads over to where the prisoners are bound and casually lays down with a low growl, severed limb in his jaws. With his gaze fixed deliberately on the captees, he begins to loudly tear the sinew and muscle from the bone. MAS wrote: you have the same amount of time and actions as you would have for a single combat round right now. If the instructions were unclear - you have the exact same movement and action options that you have during combat. Hence the request for declarations in the same format. This means I need locations for your movement, and you can do a limited amount of things in the 6-second time frame. Seth: Ties up the surrendered Izzy skirmisher at Q-22. Ulric: You have the same amount of movement that you have during a combat round to start towards helping to tie up prisoners, where do you end your move? 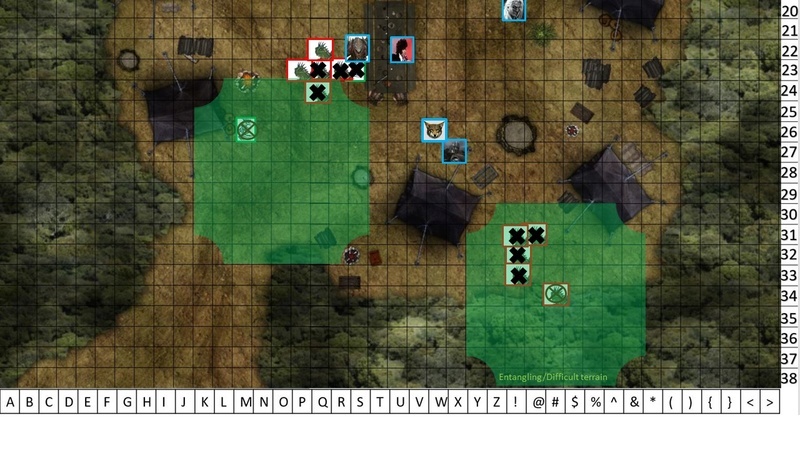 Derlyn: Casts thaumaturgy underneath the captured Izzy at Q-22. Cannot make Intimidation check in this "round". If he is moving, he needs to state an ending location. Gaston: Need a square where you are ending your movement. Anchor: Collapses in place. Conditions "exhausted" and "prone". Rip: Needs to state ending location of movement. Calculate your path to pick up the limb you are chewing on. BTW - I messed up allowing you to cast "Entangle" twice. The spell requires "concentration". You cannot have 2 spells requiring concentration active at once. concentration, such a spell ends. end concentration at any time (no action required). • Casting another spell that requires concentration. on two spells at once. Constitution saving throw to maintain your concentration. on a spell if you are incapacitated or if you die. No problem guys, communication hiccups happen. Mike - in the interest of not having to retcon the entire encounter, we'll let the spells both stand, and state they are both expired as per the end that combat. NOTE: Anyone who does not know the DRACONIC language is unable to communicate with the Izzy. The Heeka Kobolds speak common, poorly. "Mercy! God-lizard demands your hearts, we must do." The Heeka Kobold who is suddenly free from magical entanglement (M-26) begins to jump up and down in a rage. "They capture our young, threat of death in our own warrens. Who knows if they live now!" ALL PLAYERS - please roll initiative! lol... I think I'm last. Distracted by combat, the party did not notice additional forces approaching through the thick jungle foliage! 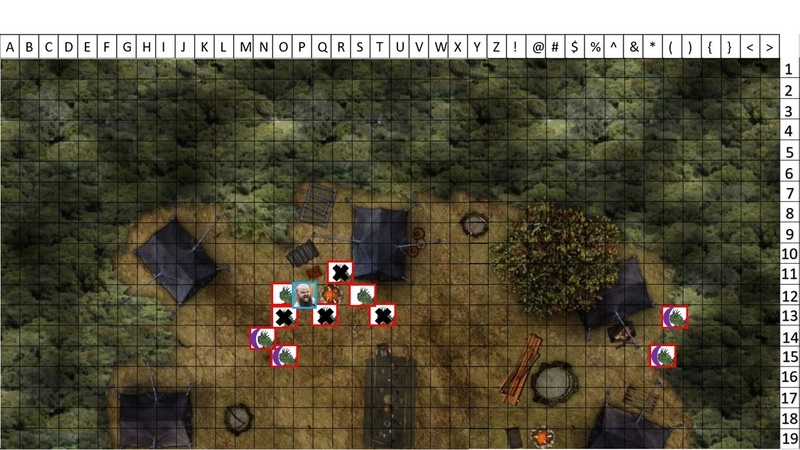 MAS wrote: Distracted by combat, the party did not notice additional forces approaching through the thick jungle foliage! BUMP. It is Alan's turn since Wednesday. If he does not respond today we will move forward and slide "Anchor" down the initiative chain. so next time the GM doesn't post for over 48hrs we can skip the enemy turns too right?